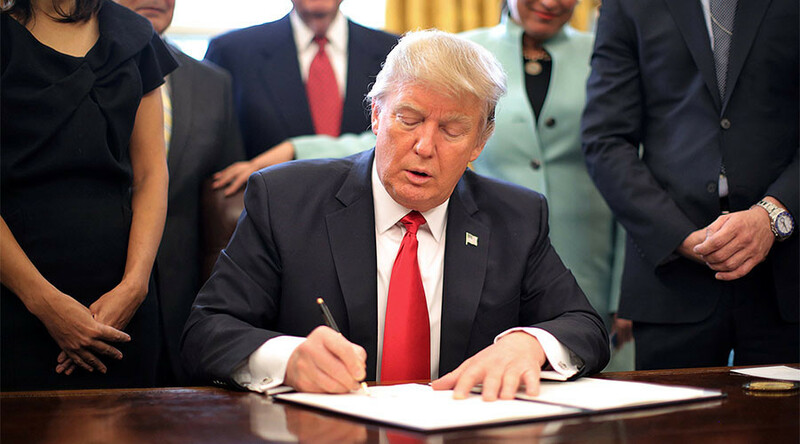 President Donald Trump has signed a new executive order mandating that for each new government regulation being enacted, two need to be revoked. The order is in line with the new president’s plan to slash regulations by as much as 75 percent, as Trump believes the expanding body of government rules is stifling the US economy. President Trump signed an executive action aimed at slashing regulations. The full details of the action, however, are still unknown. The White House sets aside a budget for regulations each year. Monday’s measure specifies the 2017 regulations budget as $0. A temporary regulations freeze was put into place on Trump’s first day in office. The new executive action establishes the process for when the freeze expires. "There will be regulation, there will be control, but it will be a normalized control," Trump told reporters at the White House on Monday morning, as he signed the order. The Obama administration was known for regulatory zeal, expanding the Federal Register to 81,640 pages in 2016 and setting a record for the greatest number of regulations issued in a single day with 527 pages on November 17, 2016. Monday’s executive order is the sixth since Trump took the oath of office on January 20. He also signed ten presidential memoranda, including the one dated January 24 that instructed federal agencies to streamline the permit process and ease the regulatory burdens on small business.